Big gaming distribution deals happen in the back rooms of E3. They happen in big metal skyscrapers and sterile board rooms in New York City and San Francisco. And sometimes they happen by exchanging pictures on Twitter. 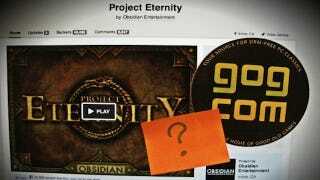 This morning, the folks behind digital distribution website GOG.com tweeted at game developers Obsidian (whose Kickstartered game Project Eternity recently made a ton of money) with a picture. Obsidian tweeted back.